Harriett Baldwin last week called on the Environment Agency to do something now for Tenbury flood resilience. In a long conversation with Phil Foxley, the Environment Agency's new flood prevention manager for Tenbury, Harriett requested that some of the short term maintenance measures mentioned in the Environment Agency's November 2007 draft report on flood alleviation for Tenbury be implemented in the near future. Harriett Baldwin said: "The draft report on Tenbury flood defences shows that it will be hard in the immediate future to win capital funding for the £5mm scheme that would give Tenbury the gold-plated protection it deserves. This is because the cost/benefit is 1.5, where there are many other schemes competing for national funding that have a higher score. I still think that we can get a scheme of this level in due course if we keep making the case in the press and with the government. After all, the government has committed to spending over £800mm per year on flood defences from 2011 onwards." On the Kyre Brook - some bed re-grading and the removal of vegetation from the banks between the bridge and the confluence. The River Teme is a site of Special Scientific Interest and therefore Natural England will need to be consulted, but I think that these short term steps would go some way to alleviating flood risk in Tenbury." 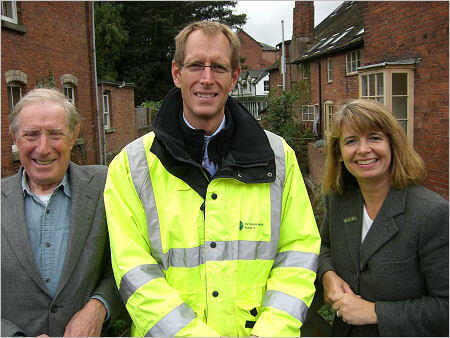 Photo: Bob Martin and Harriett Baldwin meet the Environment Agency's Regional Manager in Tenbury.